My friend Carolyn & I turned 50 earlier this year and decided that sailing lessons in the British Virgin Islands were the way to celebrate! It wasn’t difficult to find two more friends to join us and although we each had different levels of experience with sailing we found the perfect course to meet all of our needs with Offshore Sailing School’s Fast Track to Cruising course. We were fortunate enough to have the opportunity to follow our week of lessons with a second week of bareboat chartering with our families turning our celebration into a two week adventure! Watch a video recap of their “Girls Gone Sailing” women’s sailing adventure here. 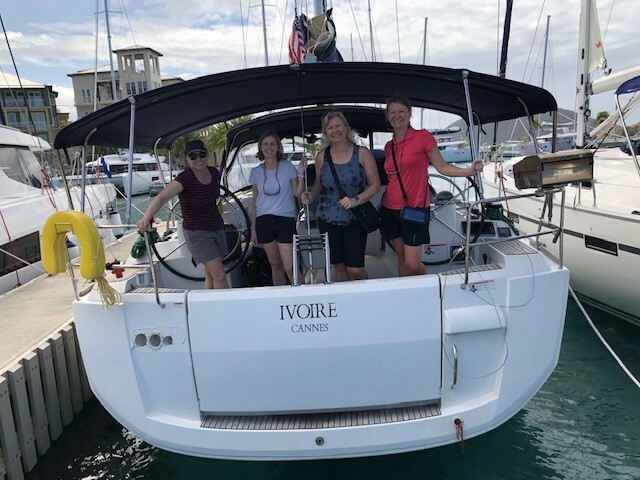 The four of us: Carolyn, Joanne, Joanna, and myself had all been on at least one bareboat charter vacation before, however in the past most of us were “just along for the ride” or happy to be helpful crew with our husbands, friend, or brother as the skipper. Personally, I knew that I wanted to be able to captain my own boat and in order to take my sailing skills to the next level I had to do something independent of the other “Captains” in my life. I needed to find a scenario where I could learn without the “safety net” they provided for me. Carolyn, also a sailor, owns a boat with her husband said she wanted to learn more so she could be confident enough to take their boat out on her own at times. 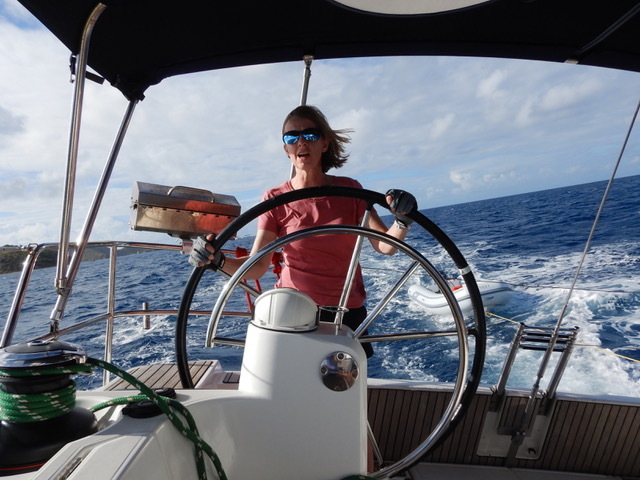 Joanne, who has many years’ experience as the “Captain’s Wife” was ready to improve her own sailing skills in preparation for sailing trips with her husband in their retirement. 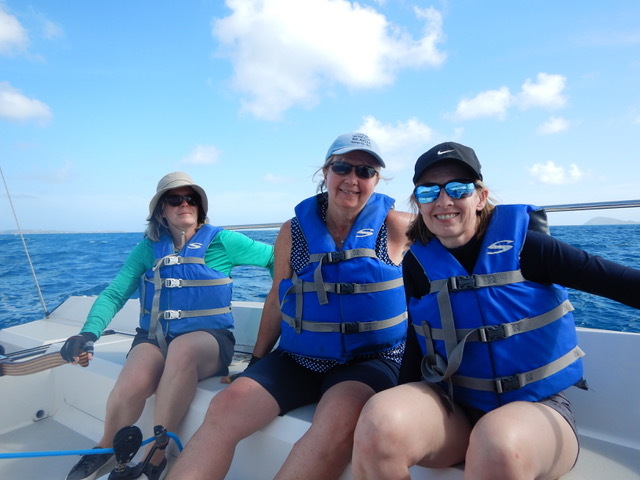 My sister-in-law, Joanna, was new to sailing and had only been on one sailing vacation before but she was up for the challenge and wanted to learn to sail! Our families were a little jealous that we were going to the beautiful BVI without them and within a few weeks of booking our course we were booking three charter boats for another eight days of cruising immediately following our “girls week.” The guys would fly down with our kids and a few friends and meet us at The Moorings base on Tortola the same day we finished our course. In total we would be a group of 18! As the trip approached during the cold winter months, we all studied our textbooks and practiced our knot-tying while we counted down the days to our escape to paradise. The Fast Track to Cruising Course covers a lot of information and skills in a short time so preparing ahead of time was really important. 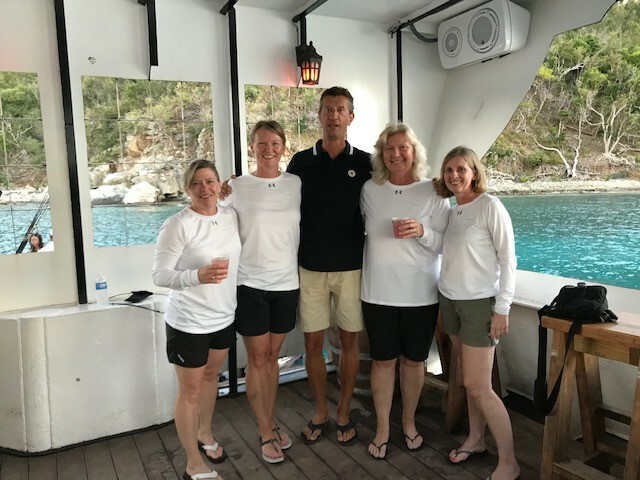 On March 1, 2019, after a very long travel day we arrived at beautiful Scrub Island Resort late Friday night, before our course began Saturday morning. We were warmly greeted on the dock with a tray of cocktails and then shown to our luxurious villa, complete with our own private plunge pool! Class started at 9AM the next morning. 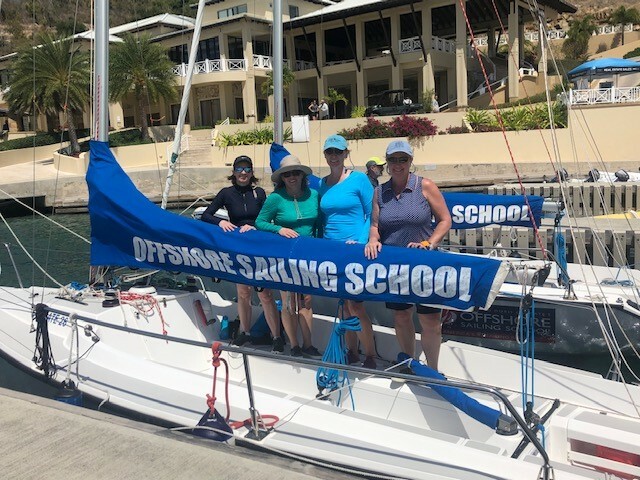 We spent the first two days completing the Learn to Sail Course portion of the course with about 12 other students while staying on Scrub Island. (Editor’s note: there were three simultaneous courses taking place the same week, with four students and an instructor aboard each of three Colgate 26 sailboats). Each morning was spent in the classroom and each afternoon we sailed aboard 26’ Colgates. Our very knowledgeable instructor, Patrick, covered the basics in the classroom and was also our instructor for the on-water portion of the course. Fortunately we had prepared well by reading the books in advance. We were still recovering from our long travel day and the amount of information covered quickly, although thoroughly, was a bit overwhelming. Each afternoon we practiced all the basics on the water, and spent time picking up mooring balls under sail and practicing man overboard drills. This was a tiring but fun experience and great preparation for the live aboard portion to come. Monday morning we met our Live Aboard Course instructor, Dutch (Folkert), to begin the OSS 103 Basic Cruising and OSS 104 Bareboat Cruising portions of the course. We were very excited to move aboard the 50’ Moorings yacht, our home for the next five days. Dutch is Offshore Sailing School’s Caribbean Manager and lead instructor for the BVI school and we were so fortunate to have him as our instructor as his incredible knowledge, patience and ability to teach was beyond our expectations. We really appreciated his ability to tailor his teaching to each of our own abilities, skill levels and experience. Most importantly, he made the week fun for all of us and although we worked hard we really had a great week of sailing with Dutch! Most mornings we did theory and covered all the knowledge components for the day, then we would set sail in the late morning with different goals each day for practicing skills such as tacking, gybing, docking, hooking mooring balls, anchoring etc. All of this was done while sailing around the most beautiful islands, with great, consistent winds and warm Caribbean weather. We picked up so many good tips for managing every aspect of sailing safely and efficiently and we got to actually DO everything, putting what we learned into practice. For a beginner there was an enormous amount to learn but Joanna felt she came away with a wealth of knowledge and practical ability. We experienced a great mix of picking up mooring balls in busy mooring fields, anchoring in secluded bays, visiting beach bars and local restaurants, as well as eating on board. From lunch at an exclusive resort to drinks on the Willie T with other Offshore students and their instructor, it was a week packed with a ton of learning and fun! By Friday afternoon, after passing all our written tests, we were ready for our “test sail” where we dropped Dutch off at The Moorings base in Road Town and sailed to the Bight, Norman Island, for the night on our own. It was very exciting to be able to do this with confidence and knowing we were a great team, having spent the whole week preparing together. Coincidentally, we did our practice sail on International Women’s Day which we proudly celebrated with champagne once we were moored for the night! The next morning we returned to Road Town to meet Dutch and were presented with our certificates for successfully completing the US Sailing Basic Keelboat, Basic Cruising, and Bareboat Charter Cruising courses. We couldn’t thank Dutch enough for making our women’s sailing adventure such a success and we still had another week in paradise to continue practicing everything we had learned. Our families and friends arrived later that same day and we moved onto our charter boats that evening to prepare for our second week of sailing. We (the girls) attended the chart briefing, unpacked provisions and prepared for the boat check-outs, ready for our departure from the base the next day. Having a second week to continue sailing after completing the course was invaluable and a great way to solidify what we had learned. The whole trip was incredible, and we came away from this experience empowered by our new knowledge, skills and confidence, ready to set new goals and make plans for our next sailing adventure! Learn more about the popular Fast Track to Live Aboard Cruising Course here. View Offshore Sailing School graduate benefits here, including up to 15% discount on your first charter with Offshore Sailing School’s partners, The Moorings.